NEP Australia adopts Lawo systems. TM Broadcast Magazine. NEP Australia has placed its trust in Lawo audio and video solutions to upgrade its OB fleet. 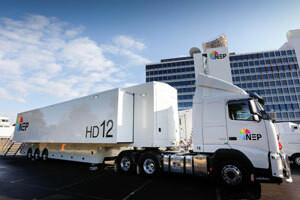 With the commissioning of four identical live production units (HD11, HD12, HD13 and HD 14), NEP Australia is consolidating its position as the leading broadcasting provider on the Australian continent. This OB Vans share the same size and technical specifications and rely on Lawo’s VSM Broadcast Control and Monitoring system for their overall control. On the audio side, each truck is equipped with a 64-fader Lawo mc256 audio mixing console plus a Lawo audio core. With the VSM system, NEP benefits greatly from an overall control and monitoring approach – this takes care of routing in the Imagine IP3 hybrid video/audio router and Imagine SX Pro Multiviewer, as well as 10 EVS XT3 units. VSM also serves as the main Tally system and delivers the dynamic UMDs. A sophisticated KVM system is key to successful operation in such a large OB Van. Again VSM integrates with the IHSE KVM Draco Tera system. With the VSM in use, operators are able to pre-configure workflows and settings in advance of a production, and have the ability to save and restore them for recurring productions and share them between all four OB Vans – this is key to reducing setup times and remaining ahead of competing broadcast providers. Each OB Van’s audio section is centered on a Lawo mc256 audio console and an audio core with eight DSP cards and five stageboxes connected via fiber using MADI. The Lawo mc²56 console and VSM work closely together, enabling VSM to have direct parameter control over the audio system. The large OB vans will be handling production for major live sports and concert events. HD11 and HD12 are already on air, with HD13 and HD14 coming into service early next year in time for the 2017 AFL (Australian Football League) and NRL (National Rugby League) seasons.